Seeking the advice for purchasing a MacBook. Discussion in 'Buying Tips and Advice' started by zolito, Aug 15, 2014. This will be the first macbook I will buy, so I need to confirm somethings. According to apple's website, the latest announced MacBook models are upgraded and released in the markets (not yet in my country) and those are 5 main models, each model has a sub-models with different hardware configurations. I- 11" macbook air (available with 1.3 GHZ 128 GB, 1.3 GHZ 256 GB dual core processors i5 and storage respectively). II- 13" macbook air (available with 1.3 GHZ 128 GB, 1.3 GHZ 256 GB dual core processors i5 and storage respectively). III- 13" macbook pro wo/retina display (available with 2.5 GHZ dual core i5 processor 500 GB hard desk). IV- 13" macbook pro w/retina display (available with 2.4 GHZ 128 GB 4 GB, 2.4 GHZ 256 GB 8 GB, 2.6 GHZ 512 GB 8 GB dual core processors i5 and storage respectively). V- 15" macbook pro w/retina display (I will avoid this one as it is too expensive for me). I will not go for the macbook air although it is much sleeker and lighter than the pro version but it lacks to the retina display which I like and used to, the same goes for the macbook pro without retina display adding to that the storage is a hard desk which will shorten the battery life, and I will also avoid the macbook pro 15" due to its price. Hence I will most probable go for the macbook pro 13" with retina display and 2.4 GHZ dual core i5 processor, 256 GB of storage and 8 GB of ram. Processor: 2.6 or 2.8 GHZ dual core i5 or 3.0 GHZ dual core i7 processors. Storage: up to 1 TB flash drive. RAM: up to 16 GB. They did not specify which processors will be built with which RAMs or storage (I know that this might be for the purpose if you want to build your own machine, but they should have showed the standard versions available). Here in Egypt, the version which I seek is almost equivalent to 2,000 USD which is too expensive for a laptop, so I must make sure that I will go for the appropriate one. Another question, how can I make sure that the one I want to buy is the one inside the box I got, because for example if you go to buy an iPad it is very difficult or even impossible to know whether this is iPad 3, 4, air or whatsoever the model, they just write down the iPad color and storage capacity not the model, and I guess that for the macbook it will be more difficult because of the many hardwares available and versions. Do any of you found the new upgraded MacBooks in the market in your country yet? Any advices or comments will be highly appreciated. Just a short disclaimer : I am by no means an Apple pro, and tbh, I don't even own a mac yet. It's just that I'll be buying the same laptop as you, so I've done a whole lot of ressearch. I'm not entirely sure that I've understood your first concern, but in the online Apple store, they do actually show all of the specs of the different models available. In the apple store, you'll only find the newest, mid-2014 rMBPs, so in 13-inches, I think the low and mid-end models have 8 g of RAM (with the option to upgrade it to 16) and 2.6 GHz, while the 512 gb has 2.8 GHz, I think ? If you want the 2.4 GHz model, some resellers might still have it in stock and might even have deals on them, but they're old models, so ermmm, it's really not sure. It's worth checking, though. If you get your macbook from the online apple store, you'll get the latest version for sure. Should be the same if you go in a branch or reseller. If you want to be 100% sure, just check the specs and see if they match what you expect, I guess ? As for what you have to get, and as you didn't list your computational needs, maybe get the base model you described wanting to get? Yes I have just figured out that in the online apple store location in the website, they exactly show the available models with the specs and price for each one, it is now much more clear for me than before. I will wait for the new releases to come here to apple's agents, because it will be the same price, so it will worth waiting a week or two, they do never make offers or discounts for an apple product even one day before releasing the newer versions. Good luck for your purchase. 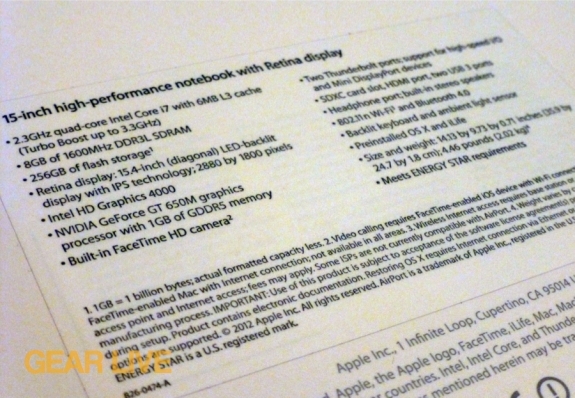 I was watching a youtube video regarding unboxing of the new macbook pro, and the presenter indeed showed the specs of the notebook written in details on the back, that is exactly what I was asking about.